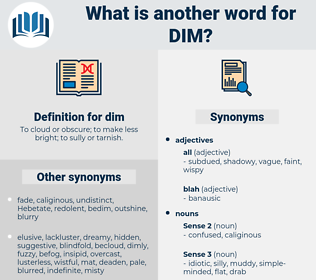 What is another word for dim? To cloud or obscure; to make less bright; to sully or tarnish. grim, dismal, Mitigating, blurred, vague, blurry, tenuous, slim, murky, blacked-out, fuzzy, dire, dull, faint. diminish, dilute, attenuate, mitigate, decrease, ameliorate, decline. favorable, luminous, lively, clear, vivacious, smart, happy, intelligent, distinct, encouraging, shining, bright, sparkling, cheerful, light, good, brilliant. ablaze, apt, definite, glinting, informed, moony, obvious, glittering, aglitter, perceptive, learned, cerebral, hopeful, intellectual, wise, discerning, schooled, illumined, sage, acute, slippery, shimmering, crystalline, highbrow, floodlit, varnished, crafty, erudite, knowledgeable, knowing, foxy, starlit, gleaming, reasonable, certain, nimble, sapient, glimmering, glazed, well-read, twinkling, shellacked, firm, sagacious, sure, alight, judicious, slick, lit, logical, trained, illuminated, strong, silken, glaring, transparent, skilled, lightsome, perspicacious, valid, percipient, sound, Relucent, prudent, scholarly, insightful, beamy, moonlit, sensible, astute, highlighted, Gemmy, resourceful, white, agleam, sane, ingenious, literate, wily, savvy, scintillating, sunlit, cunning, educated, resplendent, silky, rational, shrewd, thinking. clear up, clean, explain, brighten, lighten. Everything grew dim to her - everything indifferent. It was not dark, and yet everything looked dim and confused. down, deem, dime, dam, dm, domine, duenna, dine in, done, danu, dietitian, denim, domain, den, doyenne, demean, dean, dummy, dioon, diamine, dayton, demo, duodenum, damon, datum, dominion, dominee, donna, deweyan, dama, Duomo, dead-on, donne, dana, danaea, dun, domino, daytime, dane, damn, demon, deny, dame, do in, dune, diam, Dona, didion, dome, donnean, daemon, dine, dittany, dionaea, diadem, din, Dodonaea, downy, die down, diodon, diatom, doom, diwan, downy haw, doyen, dna, dayan, dynamo, detain, dyne, dodoma, domain name, Dahna, dawn, don, diana, danau, daimon, dudeen, deaden, donee, donnian, dominie, detainee, dahomey.